Pamper yourself while you help provide job skills for women in the Washington DC area with these DIY kits. Kiss your newest project hello. Karen Lee and Mary Kearns' DIY kits allow you to pamper yourself with all-natural emollients while providing valuable job-skills services for women in the Washington DC area. Assembling these lovely kits provides ladies living in transitional housing with the opportunity to build their resumes, develop basic job skills, and participate in a structured social skills program. Each kit includes everything you'll need to make your very own moisturizing lip balm from Fair Trade cocoa butter and organic spearmint essential oil, for a delectable and refreshing fusion of chocolate and mint. Inside the recycled box, crafters will find a vibrant, soy-ink-dyed recipe card and valuable information about the contents of their lip balm to be, including cocoa butter, sunflower oil, beeswax, and organic essential oils. Every kit makes five tins of mint-cocoa balm, making it an ideal endeavor for a rainy day or a fun task to take on with a group of good friends. Made and assembled by hand in Washington D.C.
See the DIY Lip Balm Kit put to the test on our blog! Ingredients and materials: organic sunflower oil, ethically-sourced beeswax, organic spearmint essential oil, metal tins, glass bottles, compostable cellulose bags, recycled paper labels, and information cards. Boxes, cards, and labels printed on recycled paper with soy ink, Components are recyclable, compostable, and biodegradable. Biodegradable, fully-compostable cello bags holding ingredients are made from renewable wood pulp, sustainably harvested from FSC-managed forests. At Herban Lifestyle, we have been passionate about handcrafting natural and organic bath and body products for over twelve years, ever since found Mary Kearns learned how to create herbal bath and body products at her local farmers market. Customers love our products because they smell delicious, are good for the environment, and are extremely gentle yet effective. About Mary Kearns: Mary grew up in an environmentally conscious household where natural food and recycling were the norm. Her mother was into organic cooking long before it was cool. Mary has always delighted in the process of creating new products, and takes great pleasure in learning about the healing properties of herbs. In addition to being the founder and Chief Herban Developer at Herban Lifestyle, Mary is a wellness consultant working on the scientific review of cancer prevention programs. Each kit makes five 0.5 oz. tins of lip balm. I love this product. I received one of these boxes for my birthday five years ago. The kit makes 5 containers worth, so the lip balm lasts for a while. I tried buying my own ingredients, but doing that makes too many lip balms. I ended up just buying another one of these kits, because this kit has the perfect ingredients in the perfect amount! I purchased for my daughter who is a lip balm fanatic. She has at least one in every purse & pocket. I only wish there was a choice of flavors or a few more varieties in the kit. My Granddaughters b-day gift, she really loved it. All natural product. All natural scents. Make it yourself. What's not to love? New Mexico is a dry state so the lip balm was a hit for my daughter she was able to make quite a bit with this kit that she had plenty for her self and several to give to her family and friends. Her friends all wanted to know where she purchased her kit. My niece really loved this gift. It's interactive and it's useful when you are done. 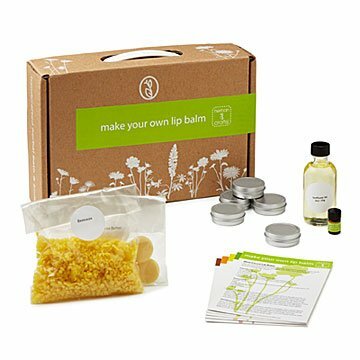 You learn the process to make your own lip balm and the ingredients are natural. Great gift for teenage girls and tweens!